I love pomegranates. They are a pain to prepare, they make a mess and all that effort seems to yield so little usable fruit. And yet, there is just something so endearing about pomegranates in the fall. Oh, how I would love to have a pomegranate tree in my backyard! I love the shape of them, the color, their tart and fruity juice. In my eagerness to get my hands on some of my favorite fall fruit, I hastily began purchasing them from the grocery store, rather than patiently waiting for them to appear in my organic produce box. They looked so lovely sitting on display in the center of the produce aisle. How could I resist? I found myself with several beautiful, large pomegranates all shiny and red, looking so pretty sitting there on the kitchen counter. I got out the cutting board and the knife. I carefully and gently began to slice into one…bright red, sticky, sprays of pomegranate juice splattered the walls, the floors, the counter top. It stained my dishtowels, my shirt, even my socks. I carefully pried back the skin, struggling to release those beautiful arils from captivity. One by one, I tediously loosened them from the pith, picked them out, set them free. Twenty minutes later, I had a small bowl of delicious crunchy, juicy seeds ready to eat. And two minutes later they were gone. Just like that. After all that work and all that mess, I am suddenly not-so-eager to prepare the rest of the pomegranates. I avoid them, decide to leave them on display (they do make for lovely autumn household decor, don’t they?). 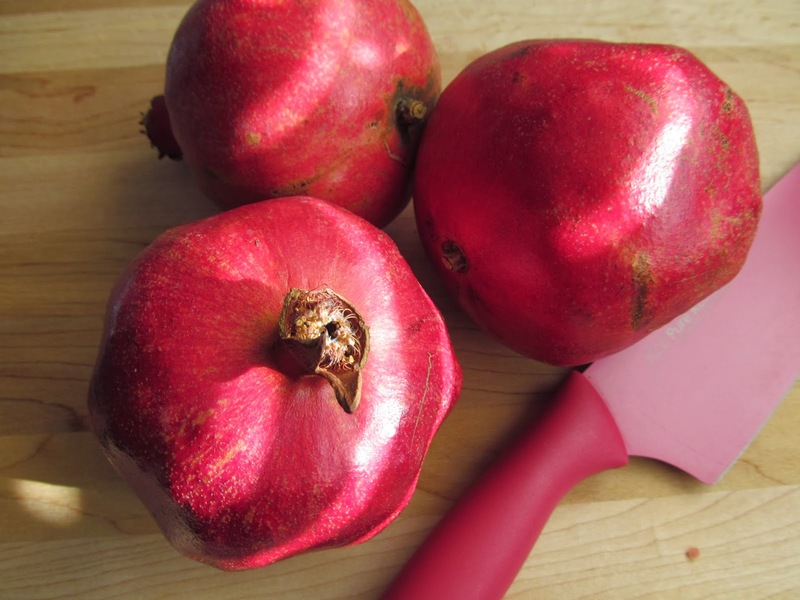 A few days later, I open my produce box, revealing a pair of perfect organic pomegranates. And the next week, three more. I can tell they are ripe and juicy because they are just beginning to crack. Uh-oh…pomegranate overload. What to do with these? As I perused the weekly newsletter from Abundant Harvest Organics, I discovered an amazing little tip from Uncle Vern. 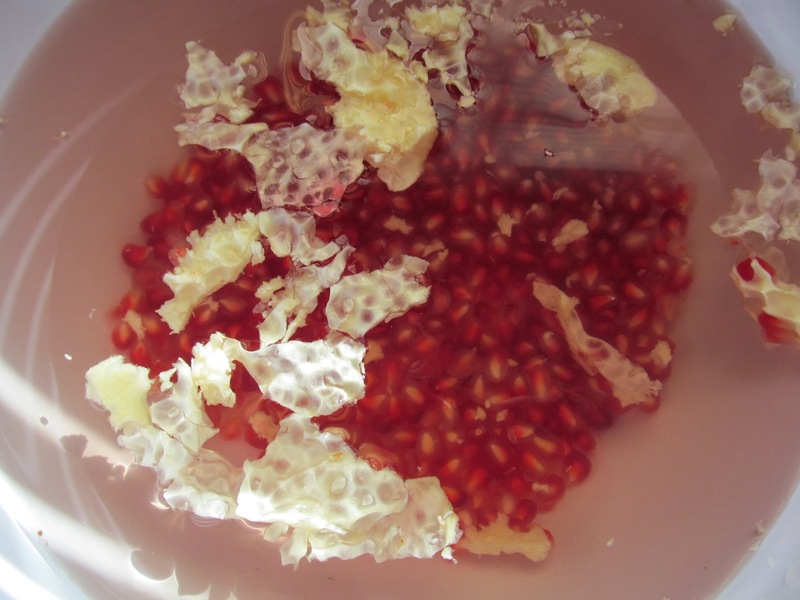 Apparently, if you slice a pomegranate in half (or quarters), place it in a bowl full of water, then turn it inside out, the seeds can be easily removed from the skin with absolutely no sticky, splattery mess. The seeds sink to the bottom and all the undesirables float to the top. The skin, membranes and little white pithy bits are then easily scooped up and tossed out. 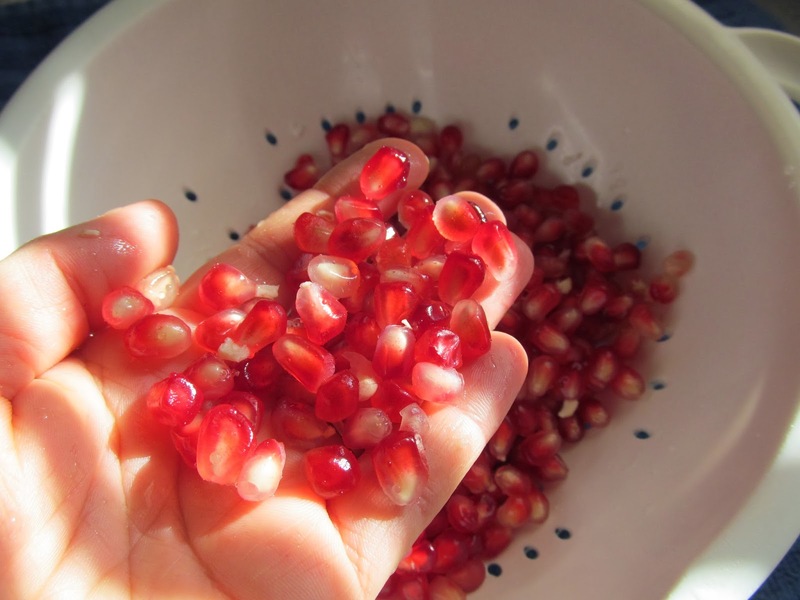 Pour those pretty pomegranate arils into a colander and just like that, they are ready to toss in your mouth by the handful. Who knew? Thank you for that nifty little tidbit, Uncle Vern! 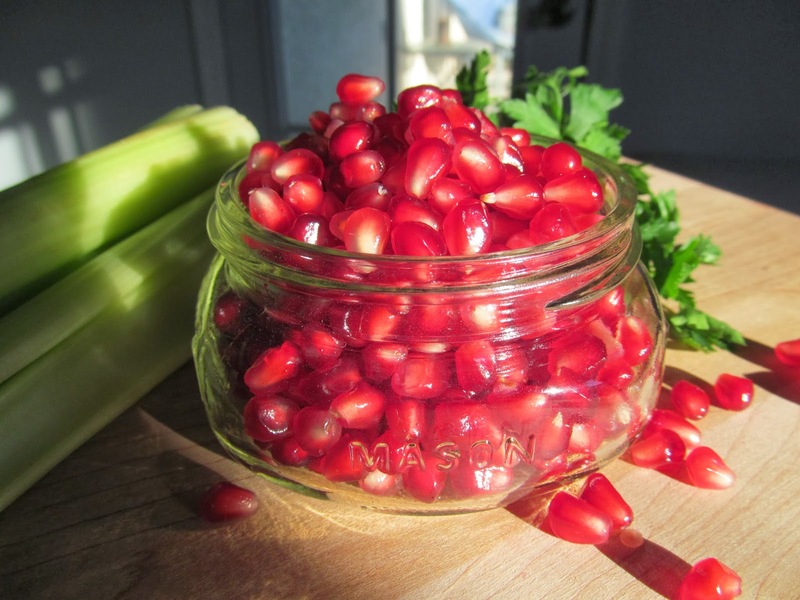 Having been enlightened, as far as pomegranate preparation goes, I suddenly found myself with about six cups of fresh, juicy pomegranate arils. So what do I do with these? 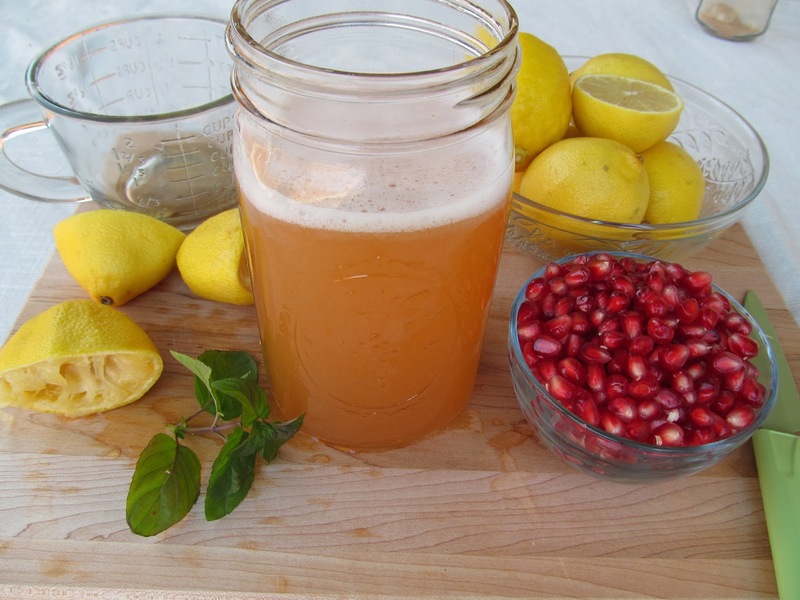 Well, I could make another batch of the pomegranate-camu lemonade that I concocted on that perfect picnic day. It is light, refreshing and super-duper charged with vitamn C. Not to mention a few extra antioxidants, even a little fiber, courtesy of those pomegranate seeds. And it’s so simple. 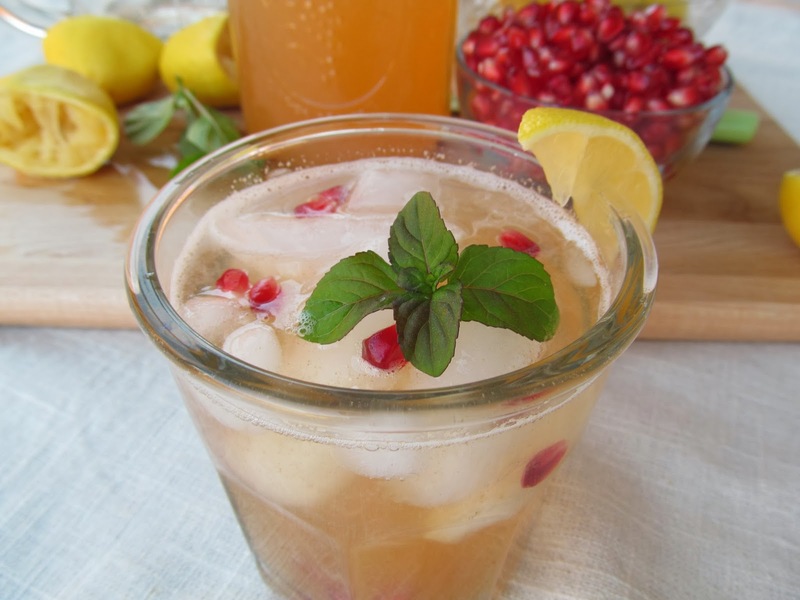 All you need is a few fresh lemons, some filtered water, agave syrup, pomegranate powder, camu powder and a handful of fresh pomegranate seeds. Pour all ingredients into a quart jar, seal with a lid and shake vigorously until the powders are incorporated (they tend to lump together). Set the lemonade aside, allowing it to steep for a few hours. 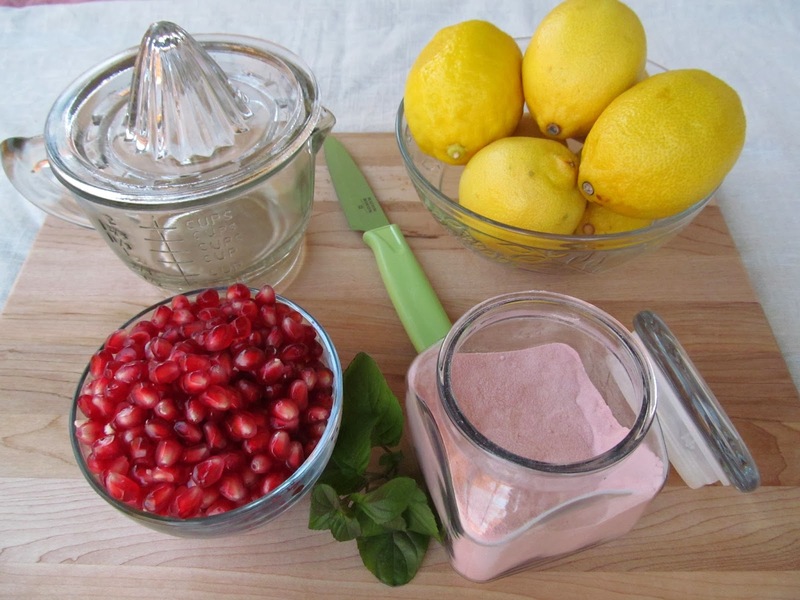 Once the powders are thoroughly incorporated, muddle the pomegranate seeds a bit and give it a few more good shakes. Keep in mind, most of the measurements in my own recipes are, shall we say, not exactly precise. So, you may need to adjust some of the ingredients to suit your own tastes. My lemonade was a little on the tart side, even more so after an over-nighter in the fridge. You may want to add a little extra sweetener, less lemon or more pomegranate flavor. And now what? 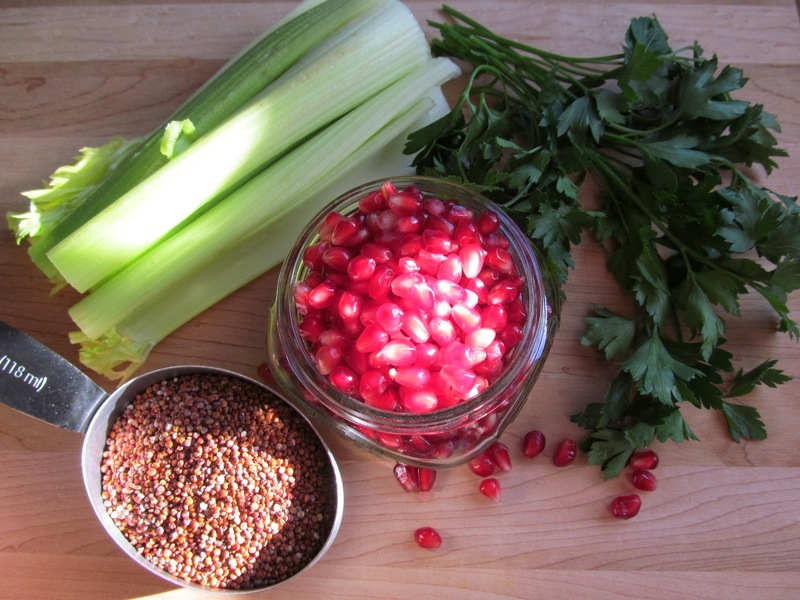 I wandered the web, searching my favorite foodie blogs for a new and interesting way to use my pomegranate seeds. Maybe a salad or a warm side dish of some sort? 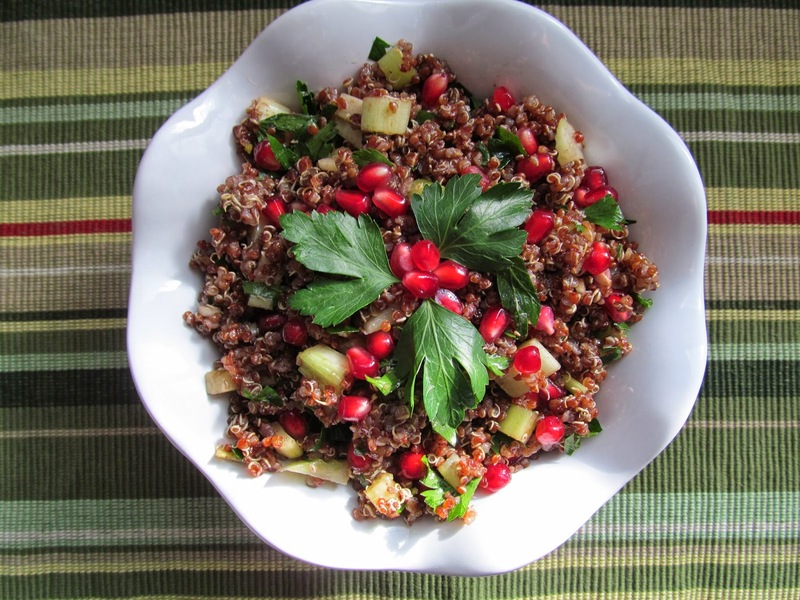 I happened upon this recipe for a Pomegranate Quinoa Salad from cookieandkate. 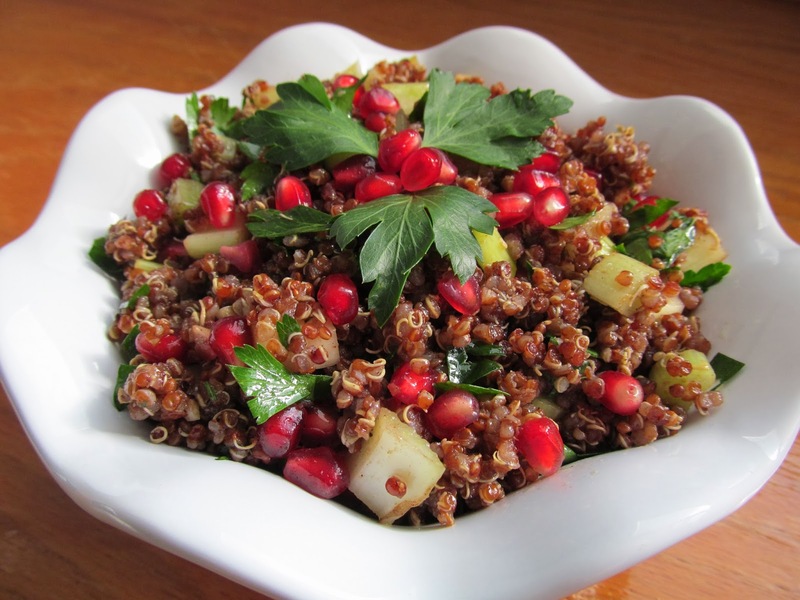 It sounded very healthy and simple with red quinoa, celery, parsley and balsamic vinegar. But it was the allspice and pomegranate that had me intrigued. So, I gave it a try. This salad was absolutely delicious! The allspice adds a distinctive and unexpected flavor, very fitting of this fall season and something delightfully different to pack for lunch tomorrow. I take great pleasure in things like this, a little treasure unearthed during a good foodie adventure. Yet, it made a very small dent in my supply of pomegranate seeds. I had all those extra seeds on the loose with nowhere to go, so I rounded ’em up, bagged ’em and threw ’em in the freezer. They should work well in smoothies, don’t you think? I tried whipping up a smoothie with some random fruits and superfood ingredients. I was certain my concocted combo would complement one another. I was, however, so very wrong. It was the worst smoothie I have ever tasted! And how does one even manage to make an awful smoothie? I never imagined it was possible. Well, I gave it another go and my second attempt was far better. In fact, it was downright yummy! Besides which, it was berry rich in antioxidants. 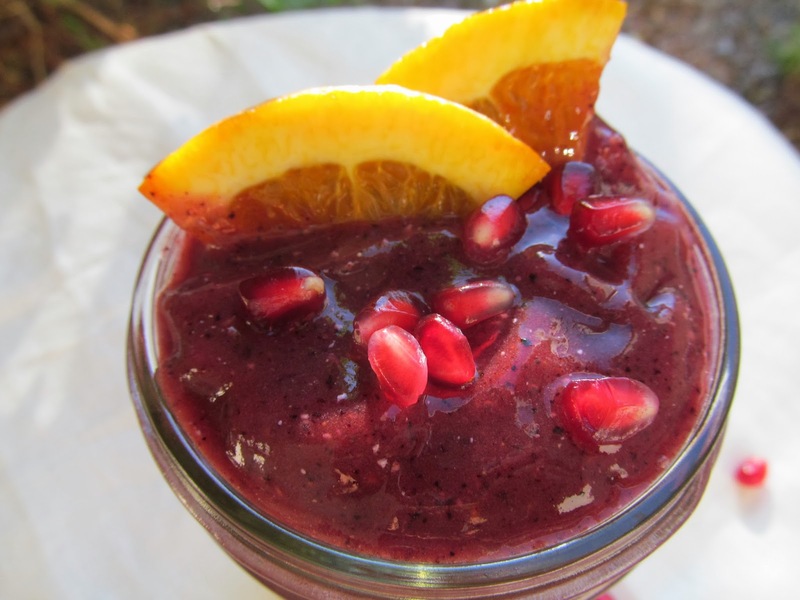 This blueberry pomegranate smoothie will definitely make a reappearance in my morning routine. 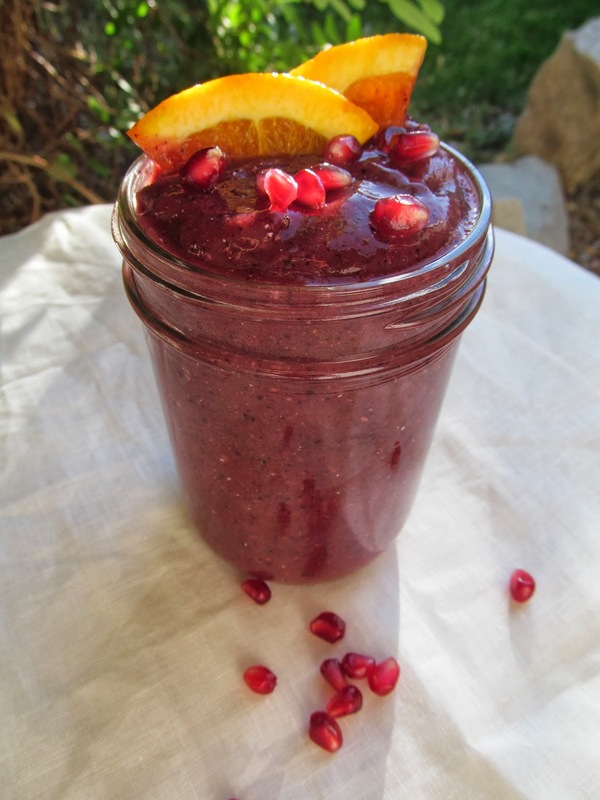 Toss it all in a blender, whir stir and enjoy! I feel a sweet sense of accomplishment as I prepare to settle into a new week. I do hate watching beautiful things go to waste, aware of the hidden potential, but unable to bring it to light. As far as pomegranates go, I do believe I tapped into something special with this alluring autumn fruit. All it took was a nifty new trick, an exploration in flavor and preserving the possibilities. Look beyond the mess, discover the hidden potential in whatever you do. I like the water tip for sending the pomegranate. I can tell when my husband has been to the produce isle in the Fall. My kitchen looks like a crime scene minus the tape. I love your blog. That's funny! I was so thrilled to learn that trick, I just had to share. I'm so glad you enjoy my blog. Thank you so much!